U.S. stocks slipped on Friday, adding to the S&P 500’s first weekly decline in the past four weeks as nervousness about September’s payrolls report culminated in the smallest monthly jobs gains since May. The economy added 156,000 new jobs last month, trailing expectations for 172,000, while revisions to the prior two months subtracted 7,000. The unemployment rate inched higher from 4.9% to 5% as the labor participation rate edged higher. Wages rose slightly along with the average hourly workweek. Despite the slower pace of hiring, Wall Street economists believe the increase is “just enough” to warrant the Fed to raise rates by year-end. For the week, the S&P 500 fell 0.60%, the Dow Industrials declined by 68 points (-0.37%), and the MSCI EAFE (developed international) lost -0.77%. In a recent report, JPMorgan economists’ believe that disinflationary shock is now fading, with goods-producing industries and business spending likely to benefit most from this shift. The latest news flow tends to support this view as proxy indices for capital goods rebounded in August, and September global manufacturing PMI’s are tracking at around 2% growth in global industrial production, up from 1% in the first half of 2016. Meanwhile, The Bank of Japan (BoJ) and the European Central Bank (ECB) are reticence to further ease monetary policy, despite their recognition that inflation is likely to materially undershoot their inflation targets over the next few years. This highlights constraints in using unconventional stimulus tools much further. In addition to questions about the efficacy of further asset purchases and “no interest rate policy”, central banks face rising public and political opposition. As the above chart shows, while the U.S. moves closer to its 2% inflation target, core inflation is stuck below 1% in the Euro area and appears poised to fall to zero in coming months in Japan, while inflation expectations have moved lower. 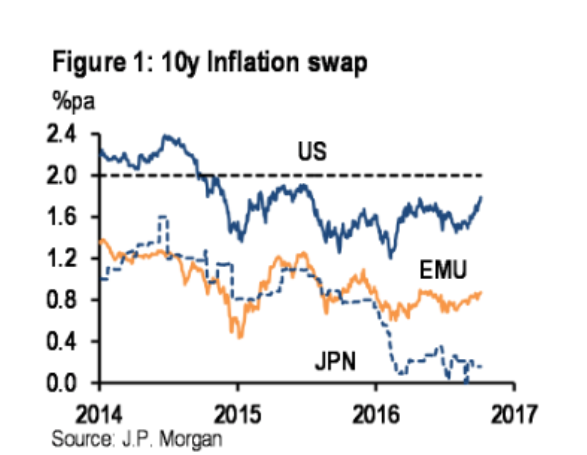 Moreover, both the ECB and the BoJ only envision a slow return to 2% target for inflation over the coming years. Consequently, the constraint of a slow reflationary trend over the coming years should not be underestimated as an offset to the view that central bank tools are reaching their limits and supply side disappointments are beginning to bind. Some materials are chosen by the Cetera Investment Management team and summarized by Jason Vitucci who is not affiliated or registered with Cetera. Cetera Investment Management provides investment management and advisory services to a number of programs sponsored by First Allied Securities and First Allied Advisory Services. Cetera Investment Management individuals who provide investment management services are not associated persons with any broker-dealer. International investing involves additional risk, including currency fluctuations, political or economic conditions affecting the foreign country, and differences in accounting standards and foreign regulations. These risks are magnified in emerging markets. Investing in companies involved in one specified sector may be more risky and volatile than an investment with greater diversification.